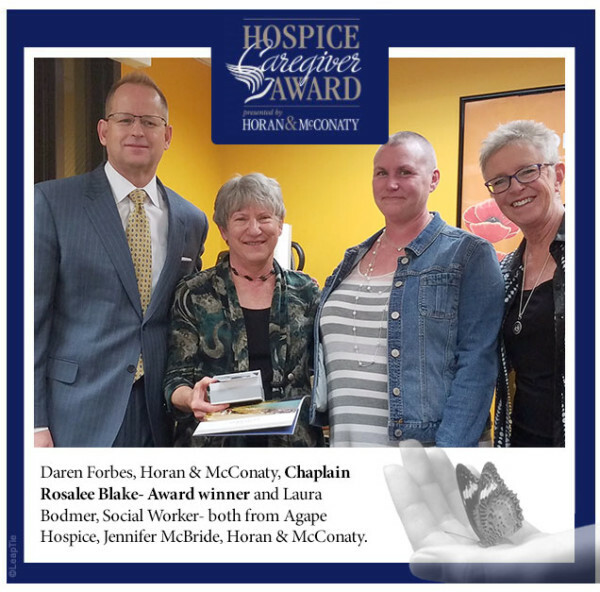 Chaplain Rosalee Blake is the winner of the Hospice Caregiver Award presented by Horan & McConaty. She was nominated by Laura Bodmer from Agape Hospice. I nominate Rosalee Blake, Chaplain with Agape Hospice for the Caregiver Award. I have had such privilege in working with Rosalee as our team chaplain. Often in this work we find ourselves going from one urgent need to another and this can cause great anxiety. Despite the hustle and bustle of maintaining high caseloads and high patient, family and facility needs, Rosalee always brings with her a calm and calming presence. She is able to sit with the patients and their families during high stress moments offering such compassion, warmth and empathy for their experiences. She truly honors where the patient is in his or her end of life journey. On countless occasions I have been lucky enough to witness just how much support she brings to patients and their families even as they might feel their worlds are crashing down around them, Rosalee brings love and light to them and holds space for them to process their life, experiences, and losses. Each time Rosalee offers prayer for a patient, I have seen immediate relief. Rosalee’s ability to offer gentle, and patient focused prayer is really something special to be present for. I see the patient and/or families relax, and a look of calm sweeps over their faces, and their bodies. No other discipline is able to do this so remarkably. Rosalee, our chaplain offers such beautiful care to our patients and families at times of existential crisis, acceptance and peace.